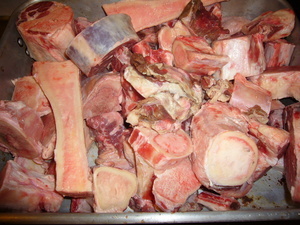 Rinse bones and place in a roasting pan. Roast at 450 until the bones are carmelized. 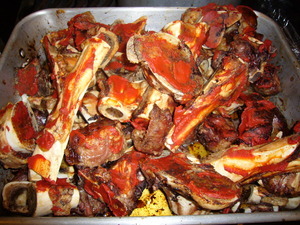 Paint the surfaces of the bones with the tomato paste. 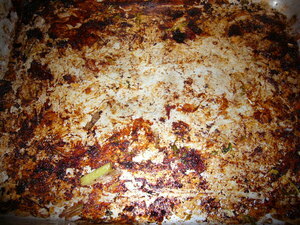 Return to the oven and continue roasting till the tomato paste starts to caramelize. 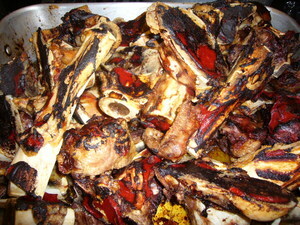 Place bones in a large pot and cover with COLD water by about 4 inces. 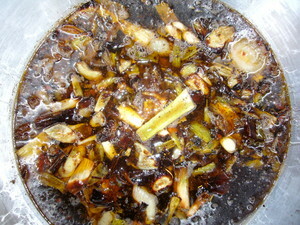 Slowly bring to a simmer DO NOT BOIL Skim scum as it rises to the top. Pour off the fat in the roasting pan, reserving about 1/2 cup. 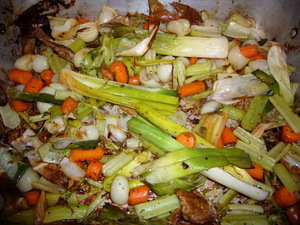 Add the veggies to the fat in the roasting pan and return to the oven. Roast, stirring from time to time till veggies start to caramelize too. 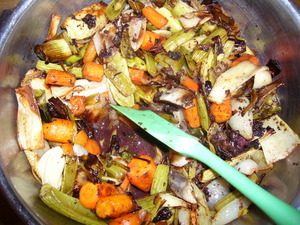 Reserve the veggies in a bowl as you continue to skim the stock. You will have fond in the bottom of the roasting pan. Add the wine to the pan and scrape up the fond with a wooden spoon. Return the pan to the oven and reduce the wine by about half, scraping the bottom from time to time, until the fond has dissolved into the wine. Add the wine to the veggies. 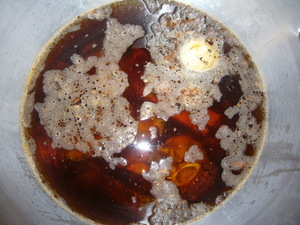 When you're done skimming the stock, add the veggie/wine mixture. 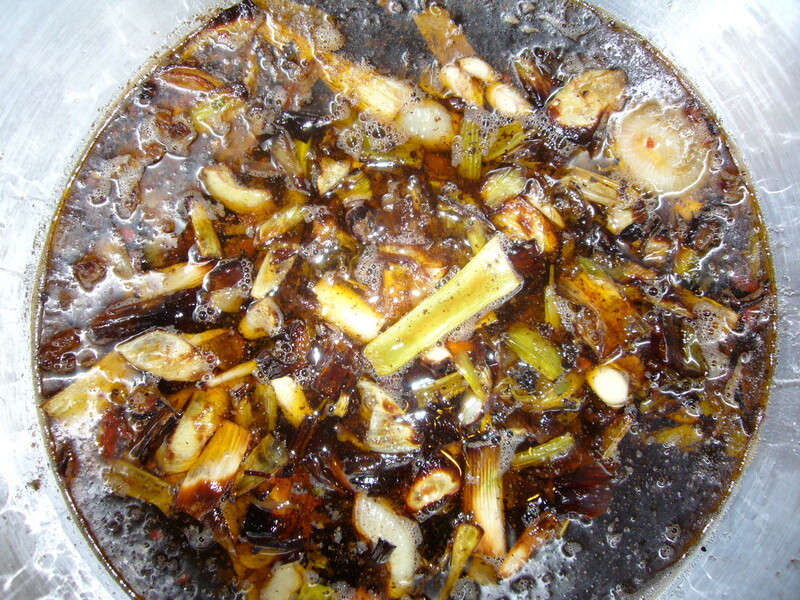 Continue to simmer the stock for about 12 hours. Do not allow to come to a boil. Strain the stock and package. 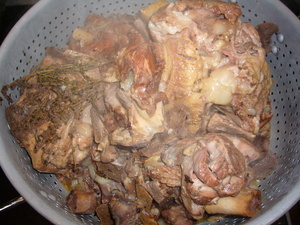 Use the finest strainer you have to make the stock as clear as possible. 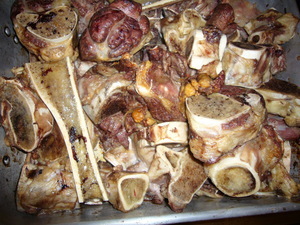 how many cups of stock do you get from ten pounds of bones ?